Terem was engaged by Qantas to create the Android application for Qantas Wellbeing (previously Qantas Assure). Rapid development was required as Wellbeing customers were demanding Android support. Delivery was completed in 2.5 months. Qantas was able to meet the needs of their customers without diverting internal team. 5000+ downloads on the day of the release. Reached #1 in the Top New Apps category on the Google Play Store. Qantas Wellbeing (previously Qantas Assure) is a new, innovative business venture by Qantas Loyalty into health insurance. 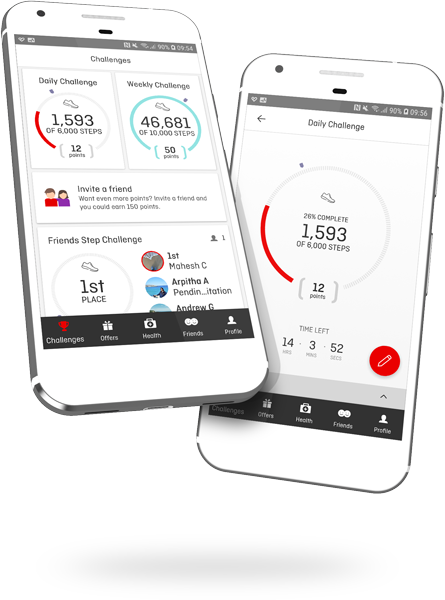 The Qantas Wellbeing mobile app allows you to track your activity, challenge your friends and earn Qantas Points for being active. Terem was engaged by Qantas Wellbeing to take their existing iOS application, work with Wellbeing’s product team and build it for Android. Terem reviewed the iOS application, broke down what was built and turned it into deliverable, user-centric stories, A UX and UI review was also conducted by Terem to transform the existing screens and workflows to work with Android’s standards, guidelines and best practices. The engagement was run using Agile delivery methodologies. Terem became a part of the Qantas Wellbeing team work in 2-week sprints. Each sprint delivered a usable application that went through vigorous quality assurance, released to a small number of beta testers, and showcased to the entire Qantas Wellbeing team. The app was released on the Google Play Story after 2.5 months of development and testing. Only minor issues were discovered upon release with 5000+ downloads in the first day.